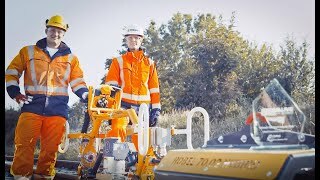 Since 1901 ROBEL has developed, manufactured and supplied track construction machines with a claim for safety and economic efficiency. This drives around 500 employees at the ROBEL premises in Freilassing, Germany, to create powerful machines and systems and deliver good service for the construction and maintenance of railway infrastructure systems all over the world. Whatever the task in track construction, ROBEL has the solution. The company produces over 100 different types of hand operated machines and tools which are in operation in about 70 countries worldwide – in solid quality and always with measurable benefit for operator and infrastructure companies. It is the competence of a century of work on track as well as the continuous pursuit of client oriented solutions that lead to easy-to-handle, safe machines. For more than 60 years ROBEL has been selling track maintenance vehicles and systems to public and private rail operators all over the world. Close cooperation with customers combined with expertise and inventiveness lead to intelligent technical solutions for topics such as work protection, environment and tight time slots. 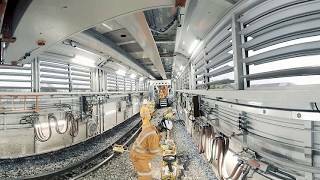 Rail exchange systems ensure that the rails arrive at the track fast, safe and in exactly the high quality they left the roller plant. Mobile Maintenance Systems – the workshops on wheels – raise operator comfort to a new level. Transport Systems are custom-made to fulfil multiple tasks in sensible environments such as tunnels and urban traffic. Good service is the premise for efficient and economic rail construction. ROBEL is manufacturer and service partner at the same time. This makes sure that the machine works reliably and is available when needed, because dwell time is money. It is the regular service and maintenance that prolong lifespan and keep the value. ROBEL servicing for track maintenance vehicles and machines delivers as promised and is worth the price. The customer gets quality and support, reliable and non-bureaucratic. With an international network of representations and service partners ROBEL is at the heart of local markets. As a result, it develops safe, high-quality and user-friendly products. ROBEL utilizes its experience and expertise to convert new technologies – also from other areas – into outcome-oriented solutions for track construction. Professional customer service keeps machines operational. The client decides how close the cooperation with ROBEL is. ROBEL delivers reliably and on time, from the spare part supply through to all-round service. The 20th century is still in its infancy when Karl Langkammerer takes over the “Georg Robel File Factory” and starts to manufacture hand-operated track construction machines. His success encourages him in his vision for track construction: Over the decades, “to robel” becomes synonymous with the secure screw connection between track and sleeper. The economic boom of the 1950s brings about a considerable change in size: Driven by the idea to optimize work on the track, ROBEL now also builds large track vehicles and rail loading trains and starts European wide distribution. In 1989 the company premises in Munich literally reach their limits – ROBEL starts to gradually move all its divisions to the railway town of Freilassing. 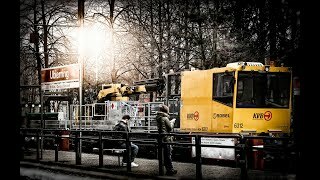 Since 1999, the company fully operates in Freilassing under the name of ROBEL Bahnbaumaschinen GmbH.